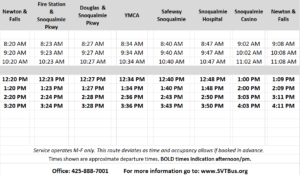 Circulating through Snoqualmie and Snoqualmie Ridge. 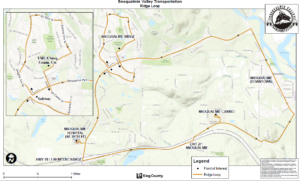 The benefit of the Ridge Loop is that you don’t need to schedule in advance if you just want to go from stop to stop. This bus has a bike rack, for a quick trip up Snoqualmie Parkway. For pickups between stops, you may flag down the bus. Make sure the driver can see you. 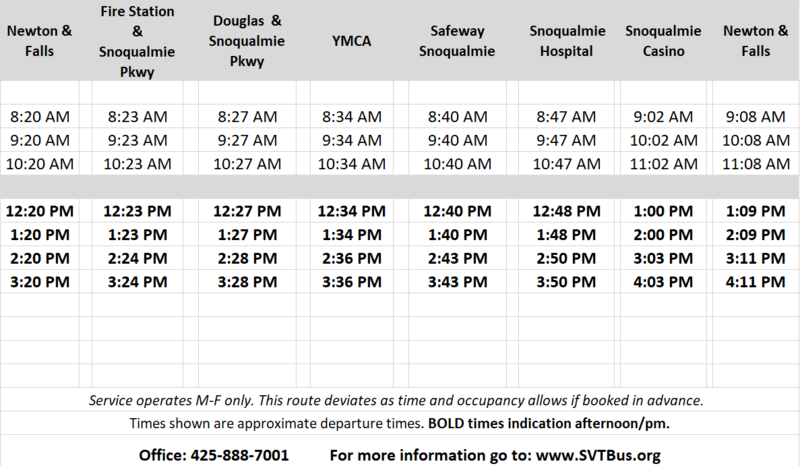 This Monday – Friday service leaves Historic Snoqualmie at SE Newton and Falls Ave. SE at 20 minutes after the hour between 7 AM and 3PM (with the exception of the 11 AM hour).